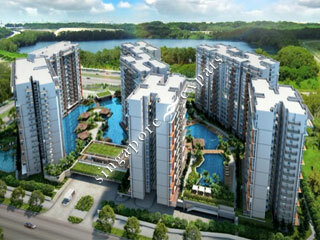 Q BAY RESIDENCES is located at 1 - 17 TAMPINES STREET 86 in district 18 (Pasir Ris, Simei, Tampines) of Singapore. Q BAY RESIDENCES is a 99-year Leasehold Condo development consisting of 630 units. Q BAY RESIDENCES is completed / TOP in 2017 (estimated), developed by QUARRY BAY PTE LTD.
Educational institutions like UNITED WORLD COLLEGE OF SOUTH EAST ASIA (EAST), NPS INTERNATIONAL SCHOOL, OVERSEAS FAMILY SCHOOL (OFS), ST. HILDA'S PRIMARY SCHOOL, POI CHING SCHOOL and JUNYUAN PRIMARY SCHOOL are near to Q BAY RESIDENCES. Q BAY RESIDENCES is accessible via nearby TAMPINES WEST, BEDOK RESERVOIR and BEDOK NORTH MRT Stations. Extremely rude management staff! I talked to tone of the staffs named Chew (not sure if she gave the correct name) for a simple enquiry and got scolded instead. Even told me that I can complain about her! WOW! Previous management is way more accomodating. Really hard to live here because if you have any enquiries. They seem not really willing to help and doesn't want to be bothered! Was waiting for my agent and walked outside the condo, was surprised at the amount of trash left at the front of the condo, empty bottles, empty paper cups, loads of cigarette butts, plastic bags. didnt feel like Singapore for a bit. Its so bad that they have to put up a sign in front of the condo to remind people not to litter. needless to say I didnt give this place any considerations. Brand new condo, near UWC and other international schools and colleges. Accessible to nearby MRT, buses and shopping malls. Great location with excellent view of the quarry. Great living place with just a few minutes ride to Tampines MRT station, Tampines Mall, Tampines One for amenities such as retail, supermarkets, restaurants,bank and more.